… but still better than never, here are the next 8 cards. The delay is caused by me being offline at home at the moment, because (surprisingly) my new phone company didn’t manage to properly connect me at time and I’m still waiting for them to do so for now. Thus I’m misusing my workplace at the moment for this post, so I’ll make it quick. This time the 8 anime shows are produced by 7 different studios. I tried to sort them theme-wise, but just plain failed for the second-half. 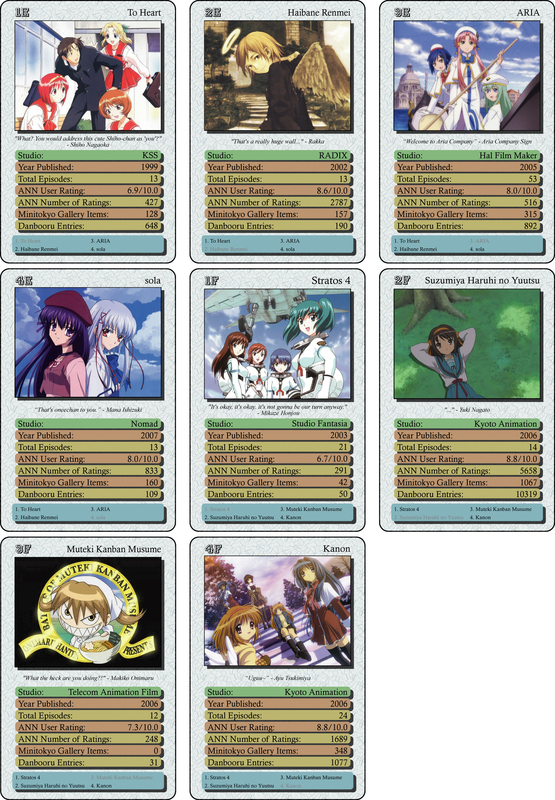 I thought about adding Air and Lucky Star to make those 4 cards completely KyoAni based, but in the end it was more important to me to add those two other series instead, although or rather because their are rather underdogs compared to the KyoAni series. And five sad Girls in the snow to make me care. Hmm…, Mai Kawasumi from Kanon. I’ve used this wallpaper already before the new version of Kanon aired, so it’s artwork is definitely either from the 2002 version or from the game. I would bet on the later one, but am not sure. I’ve found the 2002 version to be rather mediocre (but still enjoy- and watchable enough to add its wallpaper to my list) and thus I was doubtful about the need of its new incarnation 2006 at that time. Well, in the end it was a clear win for me, so I think they have chosen… wisely. Mai is, quite easily to guess, my favorite character in both versions. And btw she is (supposed to be) exactly one year younger than me. Waking from the endless dream. Darkness is my only friend, Darkness hides my tears. I’ve lost the only light, the embers fade and die. You are currently browsing the archives for the Kanon category.